It’s the end of the month, so time to check in with the popularity of our major Nebula and Hugo contenders! I use the number of Reader Ratings from Goodreads to track this. While not a perfect measure of popularity, it’s one of the best we have available, and allows for direct apple-to-apple comparisons of our books. It doesn’t matter if Goodreads is slightly incorrect, as long as it is consistently incorrect. Since this is the first year this chart has existed, we don’t yet know how—if at all—this will correlate to the Hugos and Nebulas. Are total number of readers more important than momentum? Is there a floor of popularity you have to reach to make it into the Hugo slate? How obscure is too obscure? How popular is too popular? Time will tell. First up: overall # of readers. The chart is getting big, so you may have to click on it to see it better, and the Excel spreadsheet (for all you stat geeks) is right here: Hugo Metrics. This chart shows the total number of Goodreads ratings (i.e. a measure of # of readers) for the past three months, including month-to-month change. Blanks spots are from where I added new books to the tracking this month. If The Martian wasn’t fully viral before, it is now—10,000 new readers in a single month. Wow! This is aided by the new paperback release and deep discounts on e-book prices, and we can’t ignore that Weir’s book has been out since 2011, allowing it plenty of time to build sales momentum. Still, The Martian is a full-on SF hit, something that’s been a rarity in the last 15+ years. I can only think of Ready Player One and Wool that have pushed as many copies recently. I don’t think Weir is going to be eligible for the Hugo (or Nebula), though, and that’s going to leave a big hole in this year’s award cycle. Other than that, Station Eleven that has been burning the world down: 7,000 new readers in month? More total readers than any other SF book first published in 2014? Mandel’s book is selling to both literary fiction and genre audiences, and that crossover appeal can be potent; this crossover is certainly bolstering a book like The Bone Clocks as well. I think Mandel has to be considered seriously for the Nebula: if everyone is talking about a book in December, does that make it more likely to get nominated by February? I added a mix of popular books. I had no idea California was doing so well, and it’s interesting to see how a YA novel like Red Rising or Half a King stacks up against adult fiction. 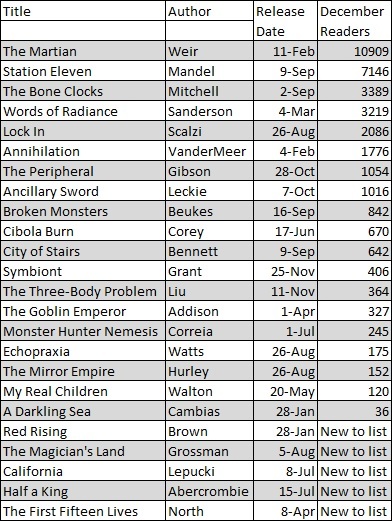 VanderMeer and Scalzi continue to do well, and Ancillary Sword is putting up solid numbers. All maintain their status as potential nominees. That’s an intriguing chart. Take the top of that chart, toss out Weir because it’s not eligible, Sanderson because it’s a sequel: is that your Hugo slate? Mandel / Mitchell / Scalzi / Gibson / VanderMeer? Toss out Mandel (too literary) and sub in Leckie, and you’d have a pretty decent guess, particularly if no campaigns muck up the statistics. One last note before I zip off: we have some good sales numbers to correlate the charts to. Publisher’s Weekly presents a limited amount of BookScan data for Hardcover bestsellers. Mandel made that list this week, and Publisher’s Weekly gave the number of 44,165 hardcovers sold as of 12/21/2014. That only represents a fraction of Mandel’s total sales: this doesn’t include e-books; Bookscan only covers around 75%-80% of the market; and this is an American list. Still, this number sets a floor for us. Hurley’s Goodreads number is 790—I figure Goodreads represents around 5-15% of the total marketplace, so a quick rule of thumb I use is to multiple the Goodreads number by 10 to get a rough sales estimate. One last piece of sales data for you. In a November 5 Entertainment Weekly article, Andy Weir was said to have sold 180,000 copies of The Martian. We don’t know how old that number was at the time of publication—or if it included e-books—and Weir has sold a ton since then, but at least that’s another part of the puzzle. I figure Weir is well north of 300,000 by now. How much can we learn from tracking numbers like this? We won’t know until the Hugo and Nebula slates are released, but it’s one more piece of the complex Hugo/Nebula puzzle. io9.com has been one of the better lists over the last 2-3 years for predicting the Nebulas. In 2013, 5 out of the 8 eventual nominees appeared on the list, including the winner; in 2012, 3 out of the 6 Nebula nominees appeared on their list, including the winner. That’s as good as anyone’s list has been (in terms of correlating to the Nebula) over the past few years. So, what are our takeaways? We see some of the big books of the year: the VanderMeer, the Weir, etc. Mandel’s placement further shows how “buzzy” her book is right now; this level of noise for Station Eleven is making a Nebula nomination more and more likely. Leckie’s absence shows that people aren’t as excited for her sequel as they were the original; this jibes with my sense (nomination likely, win unlikely). Gibson is picking up some nice traction, and The Peripheral is certainly better liked than his past few novels. I’m glad Liu made it, but this might be a case of “too little, too late” for his novel to catch on with a larger SFF audience. City of Stairs not making the list is the surprise, but Robert Jackson Bennett’s book might not be mainstream enough for io9.com. I think there’s an argument to be made that the massive sales of Mitchell, VanderMeer, and Mandel place them in a different category than Bennett or Addison in terms of these awards. Grossman has the popularity and critical respect to be a player in this year’s Nebula and Hugo—if the book weren’t #3 in a series. Will the Jordan/Sanderson nomination last year loosen the anti-sequel bias of the awards? Or would any loosening of that bias aid Sanderson and not Grossman? I’m seeing California pop-up too often on these lists, and I’m going to add it to my Nebula prediction (somewhere down in the #10-#15 range). Otherwise, this list re-enforces what we already know about the awards: our major players are still the major players, with Mandel playing the part of a late-charging challenger. That’s quite a run for fantasy: 0 wins for 40+ years, then 7 wins in 12 years. When the dam breaks, it breaks. A couple things jump out: only 1 of those 7 wins is for a “secondary” world novel (the Bujold); the rest take place in some version of our own world. Given the lasting popularity of the Tolkein-style novel (takes place in a made-up pseudo-Medeival fantasy realm and involves defeating a dark evil), you might have expected that sub-genre of fantasy to lead the charge. It most definitely did not: Martin still doesn’t have a win, much less any of the Martin-influenced grimdark follow-ups. Instead, we get a cluster of fantasy novels that take place in the present and involve the incursion of magic/the unreal into our ordinary world. While the gender ration is pretty close to 50/50 (4 women/3 men), we can’t overlook the preponderance of British wins (5 British authors/1 American/1 Canadian), although Gaiman does throw “American” into his title. I haven’t yet done a study of nationality and the awards (I will), but I presume that that ratio is fairly unusual. Over the last 15 years, it’s largely been British fantasy winners, American science fiction winners. Odd. That’s as strange a chart as Chaos Horizon has ever published: 5 decades of 0%, and then a sudden jump to 50%. That kind of rapid change is statistically unusual. Even if a new group of fans came into the Hugo WorldCon around 2000 (presumably on the wings of Harry Potter mania), change this abrupt and this rapid is difficult to process. I figure that once Goblet of Fire won, everyone figured “there are no rules!!! !” or, more soberly, “if Rowling is going to win, why not other fantasy novels?” and this was enough to fundamentally shift the award. I think this change, more than anything else, has been the defining transformation of the Hugo in the past 15 years. This is also why I usually tag 2001 as the beginning of the “contemporary Hugo.” Statistical studies like this can’t tell us whether a change is good or bad, but they certainly emphasize how dramatic change can be. I don’t think the Hugo voters have fully processed this move towards fantasy, and it’ll be interesting to see how fantasy friendly the award is for the rest of this decade. This concludes Part #1 of the genre study. There is still a lot to be learned regarding the issue of genre, and I’ll be looking (probably in a week or two) at what kind of fantasy novels have been getting nominated, as well as trying to fix a number onto scope of “literary fiction” (whatever that means) nominations. Were you surprised by the genre study? Was it what you expected? Are the shifts—slower in the case of the Nebula, very dramatic in the case of the Hugo—on par with the increased popularity of fantasy? Where will these awards settle down? In a decade’s time, will the Hugo and Nebula be 75% fantasy, 25% SF? Is that good or bad? This is a very different chart than the Nebula chart: fantasy has made nowhere near the inroads into the Hugo as it has the Nebula. We are seeing a slow drift in the direction of fantasy, and, given a rough eyeball estimate, it looks like the lines might cross somewhere in the 2030s or 2040s. We even have an interesting dip in the 1990s, as fantasy, driven by authors like Gene Wolfe and Orson Scott Card, did well in the 1980s before retreating back. 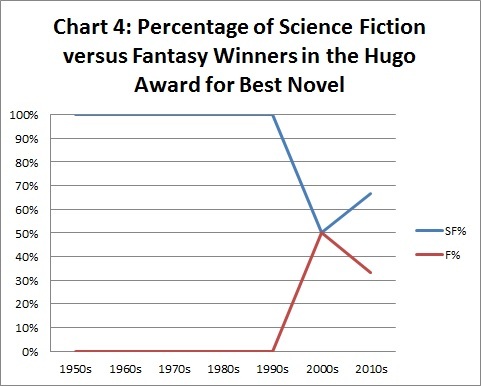 This chart was not a surprise: I always thought that the Hugo was the more “traditionally” SF award. The WorldCon voters seems more tied to the idea of SF than the SFWA voters, an interesting divergence for the two most significant SFF awards. Nonetheless, this SF bias appears to be changing very rapidly, and who knows where we’ll be by the end of this decade. 1950s: The Hugo is just getting started, and they didn’t even publish lists of nominees until 1959. All nominees are clearly SF. Keep in mind that Return of the King would have been eligible for the 1956 Hugo, so ignoring Tolkein is a pretty strong anti-fantasy statement. 1960s: We’ve got a couple borderline fantasy novels creeping in. Andre Norton snags a 1964 nomination for Witch World. I’ve classified it as fantasy, although I’ve seen others claim this for science fiction. Two fantasy books in 1967 (neither of which I’ve read, or, quite frankly, even heard of) round out the initial incursions: Randall Garrett’s Too Many Magicians and Thomas Burnett Swann’s Day of the Minotaur. We also have a 1963 French novel called Sylva by Jean Bruller I classified as “Other” because I wasn’t able to find out much about it. So, all told, we see just a little flex, but nothing of real note. 1970s: In its third decade, the Hugo is fully anti-fantasy, with no discernible fantasy books making the slate for the entire decade. It might be tempting to re-categorize some of Anne McCaffrey’s work as fantasy, but the Locus Magazine voters saw books like Dragonquest and The White Dragon as SF, and there is a SF frame story going on, even if the books have a definite fantasy feel. Two “other” books crept in, both horror themed: The Book of Skulls by Robert Silverberg and Inferno by Niven and Pournelle. But there’s nothing here to indicate that the Hugo is moving in a fantasy direction. 1980s: This is where things get interesting. Fantasy starts to pop up, first with Patricia McKillip’s Harpist in the Wind in 1980, then Silverberg’s Lord Valentine’s Castle in 1981, then Gene Wolfe grabbing two fantasy nominations for parts of The Book of the New Sun (parts #2 and #3). 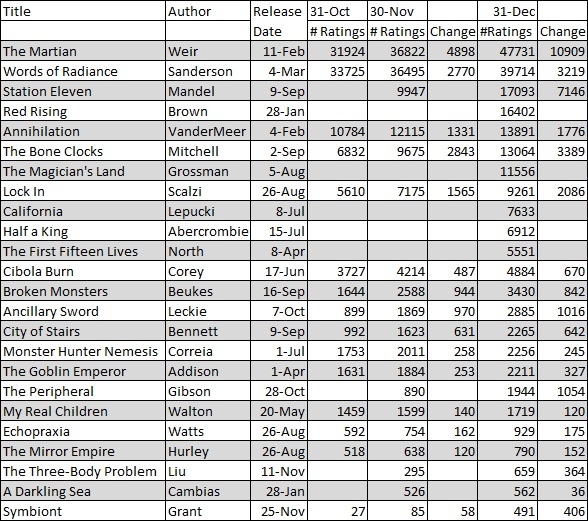 This marks a fairly substantial change, and while none of these books win, it looks the Hugo is moving to a 1 fantasy novel per year pattern (20%). Orson Scott Card closes out the decade with a run of nominations for the Alvin the Maker series, grabbing nominations in 1988, 1989, and 1990. At that time, Card was wildly popular, but this continues some of the pattern we saw in the Nebula: the initial entry for fantasy was books by authors already well-known to the SF audience. Silverberg, Wolfe, and Card get some genre-flex due to their reputations. We shouldn’t discount, though, the nominations by McKillip, or for John Crowley’s Little, Big in 1982, which shows at least some willingness to consider fantasy novels. What’s missing, of course, are the best-selling fantasy novels of the decade: no Raymond Feist, no David Eddings, no Marion Zimmer Bradley, etc. 1990s: Then the lights go out. Only 5 fantasy novels are nominated this entire decade, and, except for Card, these are all relatively minor works. After Prentice Alvin in 1990, we get Michael Bishop’s Brittle Innings in 1995, James Morrow’s Towing Jehovah in 1995, City on Fire by Walter Jon Williams in 1998, and Jack Faust by Michael Swanwick in 1998. What happened? Statistics can’t tell us that, but there were plenty of popular fantasy books in the 1990s to nominate: all the Wheel of Time books, Robin Hobb gets her start in 1995 with Assassin’s Apprentice, and, of course, the biggie: Game of Thrones in 1996. For whatever reasons, mainstream fantasy wasn’t being considered in any fashion. It’s this decade, perhaps more than any other, which gives the Hugo its “SF” only feel. To ignore fantasy all through the 1990s is quite a statement. 2000s: Then the voters totally changed their minds. Beginning with Rowling’s 2000 nomination for Harry Potter and the Prisoner of Azkaban, fantasy of all stripes begins pouring in: Rowling again in 2001 (she wins), Neil Gaiman for American Gods in 2002 (he wins), Lois McMaster Bujold picks up two nominations for her 2002 Curse of Chalion and 2004 Paladin of Souls (she wins), China Mieville starts grabbing nominations for every fantasy book he writes, including Perdido Street Station (2002), The Scar (2003), and Iron Council (2005). Martin gets into the act with A Storm of Swords (2001) and A Feast for Crows (2006), although A Clash of Kings is oddly absent. Throw in more nominations and wins for Jonathan Strange & Mr Norrell (2005) and Graveyard Book (2009), and you’ve got the single most transformative decade for either the Hugo or Nebula award. When the floodgates open, they open, and WorldCon voters all of a sudden feel comfortable voting for fantasy novels in ways they haven’t been before. I don’t know how to account for this sudden change, or, quite frankly, what to make of it. You have a 40 year period where the Hugo is a SF award; overnight, it changes to a joint SF/fantasy award. Was this an internet effect, with more people talking about their love of fantasy in the 2000s? Was this a British invasion—Rowling, Gaiman, Mieville, Clarke—where British fantasy somehow felt more “serious” and “award-worthy” than American fantasy? An after-effect of the Lord of the Rings movies raising the fantasy profile? Whatever it was, it was sudden and profound, and we’re still sorting through what this means for the Hugo. 2010s: Fantasy continues to roll in the 2010s. Mieville finally gets his win in 2010 for The City and the City, and we see plenty of fantasy nominations for Catherynne Valente, N.K. Jemisin, Jo Walton (and a win), George R.R. Martin, Saladin Ahmed, Larry Correia, and Robert Jordan. WE’re now up to around 30% fantasy nominations. Will the Hugo continue to be hospitable to fantasy? Will popular fantasy writers like Brandon Sanderson or Brent Weeks or Lev Grossman begin to make an impact in this category? Will urban fantasy begin to crash the party? Or will there be a reaction against fantasy, and a return to the SF-only Hugo of the 1950s-1990s? It’s pure guesswork here, but if anyone has any solid opinions/interpretations, I’d love to hear them. Here’s the raw data, if you want to look over it: Hugo Genre Study. The chart is pretty zig-zaggy because we’re dealing with such small numbers (10 per decade), although you do see a gradual increase over time in the direction of fantasy wins. Still, the “win” chart is nowhere near as dramatic as the “nominee” chart, proving that it’s easier to get nominated as a fantasy novel than to win as a fantasy novel. We can conclude that fantasy novels tend to underperform once they reach the slate: since 1980, fantasy novels have made up 32% of the slate but only account for 20% of the wins. That’s a statistically significant bias against fantasy novels winning, something I need to take into account for my future predictions. In an odd way, the more fantasy novels get nominated, the harder it can be for a fantasy novel to win, as the fantasy vote ends up getting split between the slate. 2013 is a perfect example of this: one SF novel faced off against 5 fantasy novels. 2312 ended up winning, because I imagine all the “the Nebula should go to a SF novel” SFWA voters voted for Robinson, and the fantasy votes were spread our across the other 5. If we’re considering genre alone, fantasy books are at a disadvantage of winning. Of course, genre alone does not determine the winner, as many other factors—familiarity, reception, popularity, demographics, etc.—also come into play. In a statistical study like this, you have to think about what the “baseline” might be, i.e. what the stats would be like without bias. Is the Nebula an award moving toward a 50/50 split between fantasy and science fiction? Why should/would 50/50 be the baseline? Isn’t fantasy more popular than science fiction, at least in terms of readers in 2014? What about critical prestige? What about the nebulous and nearly impossible to define idea of “tradition”? How about the bias towards well-known authors? How about potential biases regarding gender? What about the bias against books in a series or sequels? 1. The Nebula slate breaks into three eras: a 15 year period (1966-1980) where fantasy was largely excluded, a 30 year period (1980-2010) where fantasy was around 25%-30% of the slate, and a more recent era (2010-2014) where fantasy has overtaken SF on the slate. Are the last 5 years a statistical aberration or something that is likely to continue? 2. The Nebula winners have been more consistent since 1980, accounting for around 20% of the wins, with a general increase in % of winners over time. Be aware that these conclusions are shakier because the numbers are smaller. Nonetheless, fantasy novels have underperformed on the slate, winning at a smaller proportion than their SF peers. Tomorrow, we’ll look at how the Hugo Award nominees have shaped up! Any questions so far? 1. The Nebula embraced fantasy nominees fairly early in its history, starting primarily in 1981. This was a surprise to me; I thought the change would have come later. The Nebula has been awarded for almost 50 years, and it’s only for the first 15 years that this was exclusively a SF award. 2. 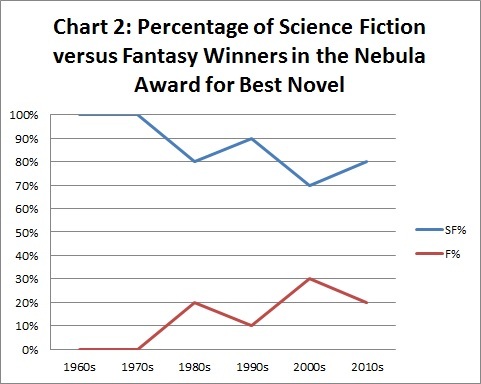 The Nebula was fairly consistent through the 1980s, 1990s, and 2000s, nominating around 25%-30% fantasy novels for that 30 year period, or roughly 2 fantasy novels per year. 3. The Nebula has changed drastically in the last 5 years. While the 2010s aren’t over, we’re more than halfway through, and already more fantasy novels have been nominated this decade than in the 2000s. Even if you believe the numbers are a little skewed, a retreat back to that 30% number is statistically unlikely. 1960s: A straightforward SF decade. The Nebula was still finding its way, and we have a very erratic # of nominees per year: 1966 saw 12 nominees, with 1967 only 3. The only “Other” book in this decade was James Blish’s Black Easter, an outstanding horror-themed book about demonic summoning. This is best read with its companion volume The Day After Judgment, usually collected together as Devil’s Day. Blish, of course, was already well-known for the SF audience, and this pattern—genre-borderline books getting nominated if they’re by well-known authors—will continue for the next several decades. 1970s: Plenty of “Other” books form this decade. In 1976, the Nebula nominated an overwhelming 18 novels for the award (check out the sfadb for the full list). With that massive list, some unusual choices creep in: Italo Calvino’s Invisible Cities and E.L. Doctorow’s Ragtime. Throw in 1974’s nomination for Thomas Pynchon’s Gravity’s Rainbow and we have our first inklings of the Nebula’s sympathy for literary fiction. I don’t know if you could classify any of those novels as science fiction or fantasy, although I’ll listen if anyone wants to try. There are some other hard-to-classify novels from the 1970s. I never know what to do with R.A. Lafferty, and he received a 1972 nomination for The Devil is Dead. Along this horror angle, Robert Silverberg grabbed a 1973 nomination for The Book of Skulls. I know people wouldn’t blink an eye if I classed this at SF, but it, at least in my opinion, is basically a realistic novel with a few horror elements. As a pure aside, this is part of Silverberg’s great “death” trilogy alongside Dying Inside and “Born with the Dead.” In my opinion, these three texts are Silverberg’s greatest achievement as an author, and if you can handle the gloom factor, they’re excellent reading. Larry Niven and Jerry Pournelle were nominated for Inferno in 1977, a variation on Dante’s Inferno. You can see that in the 1970s, the best way to get a Nebula if you aren’t writing SF is to write something horror themed, particularly if it has “devil” or “death” in the title. Lastly, we see our first fantasy books pop up in this decade. Poul Anderson received a 1976 nomination for A Midsummer Tempest, a Shakespeare-themed magic-infused alternative-history book. Anderson, though, was already a SF star, and he was one of that strange 18 nominee year. Richard Lupoff’s 1978 nomination for Sword of the Demon was a Japanese themed fantasy about demon-killing, and it fits the pattern of needing a horror theme in the title to make it into the Nebulas. So, all told, the 1970s show a definite loosening of genre-boundaries in the Nebula, although this seems to be more inflected in the direction of horror or literary fiction than fantasy. 1980s: This is where things get interesting. Beginning 1981, fantasy arrives in a major way: Robert Stallman’s The Orphan, and, more significantly, Gene Wolfe’s Shadow of the Torturer. Wolfe’s four volume The Book of the New Sun is the critical series for this decade. Each volume received a nomination, with the second volume (Claw of the Conciliator) winning the Nebula. New Sun is a difficult and hard to classify series. Drawing on elements of Jack Vance’s Dying Earth, it hovers on the line between fantasy and science fiction, a fact that I think helped it get nominated. Taking place in the far future, it initially seems to be pure fantasy, only to have some technological elements revealed in the later volumes. The Locus Magazine reviewers were equally confused: volumes 1-3 were voted as fantasy, and volume 4 made it as science fiction. In the 2012 Locus Century poll, it makes the list of both “20th Century Science Fiction Novel” and “20th Century Fantasy Novel.” Maximum confusion for everyone! I ultimately classified the four volumes just as the Locus voters saw them: #1-#3 as fantasy, #4 as science fiction. Make of that what you will. Wolfe was a driving wedge, though, and after 1981 more and more clearly fantasy books get nominated: Jon Crowley’s Little, Big, Jack Vance’s Lyonesse, Orson Scott Card’s Red Prophet, as well as Wolfe’s own Soldier of the Mist. By the time the decade is over, 14 fantasy novels have been nominated, and Pat Murphy wins again in 1989 for her Mayan-influenced Falling Woman. By this time, the Nebula has loosened it’s genre-policing. While some of these fantasy nominees were already well known for their SF (Wolfe, Vance, Card), others were not, and we see fantasy novels by lesser known authors pop up on the list. We aren’t seeing, though, fantasy novels by writers like Terry Brooks, Stephen Donaldson, Daniel Eddings, Mercedes Lackey, Marion Zimmer Bradley, etc. (i.e. the books that are bestsellers). No nomination for Mists of Avalon might be the most surprising. 1990s: The 1990s are filled with fantasy nominations. To mention some of the bigger ones: Elizabeth Scarborough’s Healer’s War, Ursula K. LeGuin’s Tehanu, Patricia McKillip’s Winter Rose, and George R.R. Martin’s A Game of Thrones. There are also a number of nominations by lesser known authors, showing a real openness in the Nebula to different types of fantasy literature. Notice there aren’t a lot of nominations for what we might think of as traditional “epic” fantasy: secondary world, part of a multi-volume series, etc. I’ll be taking a closer look at that in a few posts. 2000s: Two more nominations for George R.R. Martin, as well as multiple nominations for Nalo Hopkinson and Lois McMaster Bujold. Even someone like Terry Pratchett is able to get into the mix, scoring a 2006 nomination for Going Postal. We have plenty of lesser known authors grab nominations. For instance, China Mieville is nominated for Perdido Street Station. While it’s hard to remember, Mieville was unknown at the time: to grab a Nebula for a fantasy debut marks a major change. We also have a broad range of fantasy novels nominated this decade, from more contemporary fantasy like American Gods to 19th century fantasy like Jonathan Strange & Mr Norrell to secondary world books like the Bujold, Martin, or Pratchett. It’ll be a few more years, though, until fantasy takes over the Nebulas. Fantasy is still stuck around the 30% mark . . .
2010s: And that 30% jumps to 60% for this decade. We’ve seen an explosion of fantasy nominations in the last five years: 2010 had 4 fantasy nominations and only 2 SF nominations, 2012 was the same, and 2013 saw one lone SF novel face off against 5 fantasy contenders. Why the rapid acceleration? I, quite frankly, have no idea. The fantasy novels being nominated now come from all versions of fantasy: contemporary (Gaiman’s The Ocean at the End of the Lane, Walton’s Among Others), historical (Griffith’s Hild and Kowal’s Shades of Milk and Honey), experimental (VanderMeer’s Finch), literary (Wecker’s The Golem and the Jinni), and secondary world (the multiple nominations for Jemisin, Ahmed’s The Throne of the Crescent Moon). So, to sum up: we saw a slow start for fantasy from 1960-1970s, with horror-themed books breaking the genre divide. 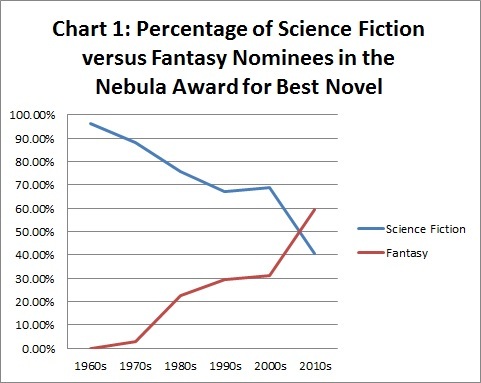 Beginning 1981, fantasy leapt into the Nebulas, occupying around 25%-30% of the award. That held steady until 2010, when fantasy leapt into the lead. All genres of fantasy now seem welcome in the Nebulas, and it’s going to be fascinating to see what happens going forward. If you want to look at the Excel sheet with the genre classifications, here it is: Nebula Genre Study. It’s that time again: today we launch the most ambitious Chaos Horizon report yet, a look at genre and the Hugo and Nebula Awards for Best Novel. Note the lack of dates: we’re doing the whole thing, from the beginning of both awards to the present! 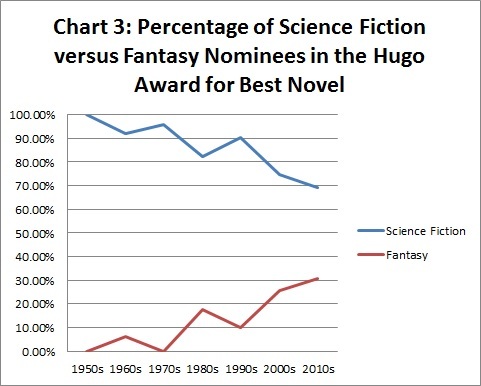 When the Hugo Awards started in 1953 and the Nebula Awards in 1966, they were exclusively science fiction awards, and this SF bias is still part of the Hugo/Nebula DNA. Consider their names or the statues they give: I imagine it’s odd to win a rocket ship for a fantasy novel. Whew, that’s a lot of upcoming posts! And, of course, I’ll entertain any requests for clarification/further data that my readers might have; it’s very helpful to have different eyes on statistical project, as this can help me see my own blind spots and biases. Basic Methodology: For this report, I assigned a genre for each of the almost 600 nominees for the Hugo or Nebula award for Best Novel. That breaks down to 311 Nebula nominees and 288 Hugo nominees, with some obvious overlap between the two awards. For the first pass—we’ll look deeper at some of the categories—I used one of three categories: Science Fiction, Fantasy, and the dreaded Other. So that brings us to our most basic methodological question: how do you define genre? Science Fiction: Takes place in the future, involves advanced technology and/or aliens. Fantasy: Takes place in the past with no advanced technology, involves magic and/or dragons and other non-real races or creatures. Okay, we’re good to go, aren’t we? Nice, basic definitions. Classify away! Once you do this, though, exceptions start popping up all over the place. What about Alternate History novels? Those are traditionally classified as Science Fiction, but they don’t fit my definition. I’d have to go back and expand that. Same thing happens with Fantasy: Harry Potter doesn’t take place in the past, but in the present moment. Okay, maybe magic is the defining feature of Fantasy. Then again . . . does every Conan story involve magic? There are also plenty of stories where Conan just gets revenge by hacking up people, no magic involved. What about Steampunk? Is that Fantasy or Science Fiction? What you’ll find is that any structural definition of Science Fiction or Fantasy blurs at the edges. This is because these are living genres, changing over time and with the different ideas/aesthetics of writers and readers. What “Fantasy” means today is different than what “Fantasy” meant 50 years ago, and it will continue to change in the future. This is further complicated by the marketplace. From a branding perspective, fantasy was not well-regarded in the 1960s, and many fantasy writers threw a thin gloss of science fiction onto their fantasy books to help this problem. Anne McCaffery, Tanith Lee, Jack Vance, Marion Zimmer Bradley, etc., all did this at times, and you wound up with something like the “sword and planet” sub-genre that can be difficult and deeply unsatisfying to classify. Maybe we should switch to some notion of authorial intent, and focus on the emotion the book tries to evoke: if the book tries to evoke horror, it’s horror. If heroism, it’s fantasy. If a sense of wonder at a technological future, science fiction. Once again, you’ll very quickly run into problems with this, and you’ll end up being what we call the “Genre Police” trying to re-enforce borders that are constantly being overwritten, and you’ll end up saying things like, “This isn’t real fantasy!” I find that to be one of the more uninteresting observations a critic can make about a work of literature. All is not lost. Just because blue blurs into green at the edges doesn’t mean that blue and green aren’t distinct colors, and this is also true for genres like fantasy and science fiction. While it might be hard to classify something like The Dying Earth, the difference between Ancillary Sword and A Game of Thrones is very obvious. I’ve talked in circles, though, and haven’t resolved the basic problem: how do we define genre? 1. It removes my bias from the equation; we don’t want my opinion as to whether or not Claw of the Conciliator is SF or F determining the data. 2. For the most part, this is easy to ascertain (see below). 3. It provides a historical look at genre, rather than reclassifying novels based on our present-day definitions of genre. To measure reader-reception of genre, I primarily used the Locus Awards classifications. The Locus Awards, a source I often really heavily on, are an annual vote by the readers of Locus Magazine regarding the best SFF novels (and stories, for that matter) of the year. Beginning in 1978, they broke their vote into two categories: Best Fantasy Novel and Best Science Fiction Novel. This information is readily available at the Science Fiction Awards Database. So, my main form of classification was to look up each Hugo/Nebula nominee on this list, and just go with the Locus voters. I figure these were the most informed SFF fans of their era, and if they believed Claw of the Conciliator was Fantasy, who am I to doubt them? 1. If I was familiar with the novel (i.e., if I’d read it) and the classification was obvious (in my opinion, sadly), I assigned a classification. For the Hugos, this was easy, as 99% of the books are unquestionably SF. For the Nebula, it’s a little more difficult, but I only had to deal with 1966-1977. 2. If I was unfamiliar with the novel, I went to Amazon.com and read the book description and reader reviews. If I felt it was obvious (spaceship on the cover, description talking about magic), I went ahead and assigned a genre. 3. If I still felt the genre was still unclear, I marked it as “Other.” Better to have uncertainty in the data than pretend it’s 100% accurate. I’ll note any “borderline” cases in upcoming posts. Is this classification of genre perfect? Absolutely not, but I don’t think any classification of genre would be. Out of the 600 classifications I had to make, I’d say about 5% of them were difficult. That’s actually not too bad for a data set. While a different researcher might classify books differently, these slight variations won’t throw the results off that badly. So, I’ll be back tomorrow with the Nebula Award and Nominees! 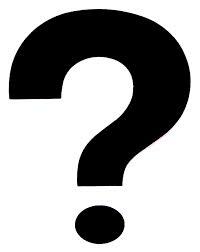 But today’s question is the one of genre: what do you think of genre, and what do you think the best way to classify it is? Boom! Bang! Flutter! Whatever sound you think books make when they sell, that’s the sound Station Eleven is making right now. Mandel’s literary take on the post-apocalyptic novel has been roaring over in the mainstream world. Supported by venues like Amazon.com (where it was declared the “Best SF Novel of 2014”), Entertainment Weekly, and a 2014 nomination for the National Book Award, it has been a break-out hit, and has received so much attention it’s bound to make some noise in the SFF world. Since Chaos Horizon is a blog dedicated to predicting the Hugo and Nebula awards, what chance does Station Eleven have this award season? A decent one, particularly for the Nebula. To put Mandel’s popularity in perspective: as of December 17, 2014, Goodreads.com is showing 13,500 reader ratings, and Station Eleven has already added 3,500+ new readers since December 1st. If we compare that to some of the other Nebula contenders, the results are stark. Robert Jackson Bennett’s City of Stairs currently clocks in at around 2,000 readers. Mandel is on pace to double that this month alone. Take last year’s Hugo and Nebula winner Ancillary Justice; despite that huge push from the SFF world, she’s still sitting at 11,500 ratings. Thus is the power of the mainstream critical world. By tapping Mandel as the darling of the season, they’ve guaranteed she’s going to be broadly read. If it weren’t for The Martian, Mandel would likely wind up as 2014’s most popular science fiction novel. Popularity, though, is only one thing that impacts the Hugos and Nebulas: what is the SFF world going to think of Mandel’s book? That’s a tougher question. The SFF world has been slow to review Mandel’s book: Tor.com doesn’t have a review up yet, and neither does Locus Magazine. There’s often some trepidation regarding books like this: is this a hit-and-run author, someone will write one SF-lite book before retreating back into the fortress of literary fiction? Is she just using SF to be “edgy” and “cool,” or does she have a meaningful relationship with the genre? Only time will answer those questions, but the SFF world can be very resistant to books branded “better than your typical SF novel.” Neither The Road nor Never Let You Go grabbed Hugo or Nebula nods. In contrast, sometimes these novels do break through: The Yiddish Policeman’s Union won both awards, and books like We Are All Completely Beside Ourselves and The Golem and the Jinni grabbed Nebula noms just last years. Which path will Mandel follow? Mandel’s novel charts the inter-connected fortunes of a group of characters both before and after a society-ending flu pandemic. The novel opens up during a performance of King Lear, where an aging actor dies of a heart attack. The flu breaks out almost immediately after, and Mandel traces a variety of characters and their relationship to this dead actor (who turns out to be a Brad Pitt style Hollywood celebrity). Divorced multiple times, we get long sections concerning his former wives and how those marriages collapse, including his strained relationship to his young son. We also learn about one of his paparazzi, who has coincidentally become a EM technician who tries to save him at that fateful King Lear performance. Station Eleven is laced with connections like that, as Mandel shows what she calls the “half life of marriage” and the way human interconnections and relationships spread forward and backward through history, even across the line of an apocalypse. The intense focus on the meaning of human connectivity gives Station Eleven a very different feel, and it has certainly opened up the book to a very mainstream audience. Many of these characters survive the pandemic, and we get to hear about their wanderings some 20 years later in a decimated Canada/America (Mandel is Canadian, as are many of her main characters), largely as part of a travelling Shakespearian troupe. The Station Eleven is a comic book written by one of the actor’s wives, and it winds up in the hands of some of the children who survive the flu; you’ll either find that coincidence deep and meaningful or twee and manipulative. For fans of literary fiction, Mandel reads like she’s brought together elements of The Road (but much less violent), A Visit from the Goon Squad (the focus on celebrity and character interconnection), and The Amazing Adventures of Kavalier & Clay (the comics stuff). That’s learning from three former Pulitzer Prize winners, so it’s no wonder this book is being gobbled up by the literary mainstream. From that perspective, it’s a great referendum on what’s been happening on the literary/genre boundary over the past decade. Station Eleven might be a stronger contender for the Pulitzer than the Nebula. From a more speculative perspective, the book is more interested in character than it is in world-building, and the post-apocalyptic aspects of the book are probably its weakest. In many ways, Mandel treats the pandemic symbolically rather than realistically, and her ruined society of the future doesn’t seem particularly accurate or well-imagined. Her interest is in relationships, not the nuts-and-bolts of starting up generators and getting the electricity going once again. Whether or not readers—and Nebula voters—find this a telling flaw is up in the air. Will SFWA voters embrace the emotional and character-driven aspects of the work, or will they see this as “not speculative enough” for the Nebula? Ultimately, I see Mandel as a viable Nebula candidate (I currently have her at #6), but I want to see more SF specific reviews to see just exactly what dedicated SFF critics are thinking of this book. The New Yorker also had a big article about genre and Station Eleven that is worth a read. Mandel’s biggest mainstream impact, though, has come from “Best of 2014” lists that have consistently put her book at or near the top. A wide-range of reviews, and the best way to describe most of them is as “qualified enthusiasm.” The most common word that came up in these reviews was “beautiful,” high praise for Mandel’s prose and characters. The enthusiasm was a little tempered when it came to world-building, and several reviewers pointed out the relative weakness of her post-apocalyptic setting. Once you step away from the SFF focused blogs, the enthusiasm for the book becomes far more unqualified, with plenty of praise being heaped on Mandel for her rich characters and emotional world. I thought the inevitable comparison to The Road worked well in some of these reviews, drawing a useful contrast between McCarthy’s nihilism and Mandel’s optimism. So, that’s the basics on this year’s most-buzzed about literary SF novel. What are Mandel’s chances? Another 15th of the month, another chance to update my Nebula Award for Best Novel prediction. The Nebula Award nominating process has already begun, and runs from November 15th until February 15th. SFWA members are already busy voting and plotting! There are a couple of changes since last month’s Prediction. As more “Best of 2014” lists are published, we’re getting a better and better idea of what both the Mainstream and SFF Critics think are the major works of the year. While neither of these lists will be perfectly correlated to the eventual Nebula slate, both provide essential information that can help us make good predictions, particularly for books in similar categories. For instance, in the “somewhat unusual fantasy novel” category, we have three main contenders: City of Stairs, The Goblin Emperor, and The Mirror Empire. Robert Jackson Bennett and Katherine Addison have done very well on the SFF Critics list so far, while Kameron Hurley hasn’t. Ergo, I should rank Bennett and Addison higher than Hurley. My prediction also factors in things like Reviews, Popularity and past Nebula patterns regarding Repeat Nominees, sequels, genre, etc. As we get closer to the Nebula slate, we can hope the prediction gets more accurate, but a lot can still change between now and February. So what’s changed in my list? City of Stairs creeps up to #3, and it’s getting pretty close to being a “sure thing” for this Nebula season. A stand-alone fantasy book taking place in a mysterious city filled with dead gods, it’s both accessible and literary, and unusual enough to stand out in a crowded field. I added a dreaded “?” in Slot #5. This reflects the reality of the Nebulas: over the past decade, there have been some very unusual Nebula choices, books that were off the radar and wound up in the slate. Something like this is likely to happen again, and I don’t want to pretend we can predict the slate with 100% accuracy. Hell, I’ll be happy if I get 4 out of 6 right. Next, Emily St. John Mandel’s Station Eleven is something of this year’s Nebula wild-card. This has been roaring over in the Mainstream world, but I don’t yet have a clear sense of how SFF fans and writers have been receiving it. I’ll be doing a Review Round-Up soon, and I’ll be interested to see what the broad range of SFF blogs and readers are thinking about this book. It doesn’t take broad support to make the Nebula slate; instead, it takes a small group of passionate fans. Station Eleven is likely to attract that necessary group, even if it is a little more problematic for the broader SFF community. I have her at a shaky #6. Claire North’s The First Fifteen Lives of Henry August debuts at #11. I initially discounted this book because it sounded too much like Kate Atkinson’s Life After Life, but North has placed well on year-end lists. Apparently, audiences aren’t tired of the “Groundhog’s day” style-novel, and North certainly provides something different than the rest of the main contenders. Helen Oyeyemi’s Boy, Snow, Bird has done extremely well on the Mainstream List, and Genevieve Valentine’s The Girls at the Kingfisher Club has also gotten some good online chatter. Both are re-told fairy tales without obvious speculative elements. There is some debate as to whether this sub-genre should be considered SFF, but I think positive reception has boosted either (or both) of their Nebula chances. They debut in one category together at #12. You can’t move books up without moving some books, and I’ve moved down some of the authors that haven’t been showing up on “Best of 2014” lists: Jo Walton, Jack McDevitt, Kameron Hurley. For whatever reason, these books aren’t getting the same kind of year-end reception as the other books, and this definitely hurts their Nebula chances. Remember, the Nebulas are much harder to predict than the Hugos. The Nebulas involve a smaller group of voters (SFWA members, many of whom don’t seem to vote), publish less data (it keeps the vote totals secret), and tends to nominate obscure books (Nagata and Gannon last year, for instance). The Nebula is also a more “writerly” award; some of the popular authors in the Hugo—Scalzi or Stross—have never done well in the Nebulas. It’s harder to predict what writers are going to like than fans, given that fans tend be more vocal about their likes and dislikes. Disclaimer: As always, Chaos Horizon predicts what is likely to happen in the Nebula awards, not what “should” happen. By data-mining past awards, I try to discover patterns to base my predictions on. This is an imperfect science—the past is not a 100% predictor of the future, otherwise we’d know everything that would happen—so take the list as no more than a rough guide. The leading candidates, based on critical reception and past Nebula performance. 1. 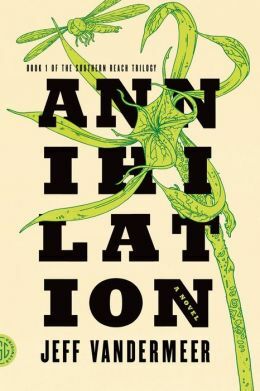 Annihilation, Jeff VanderMeer: Nothing has happened this past month to disrupt VanderMeer’s frontrunner status: good placement on the Mainstream list (#2) and SFF Critics list (#3), good sales, great critical reviews, and strong across-the-board support. I do worry how the Nebulas will handle whether or not Annihilation or all of Area X get nominated. I think VanderMeer has a better shot if only Annihilation makes it, as far more people started this trilogy than finished it. 2. 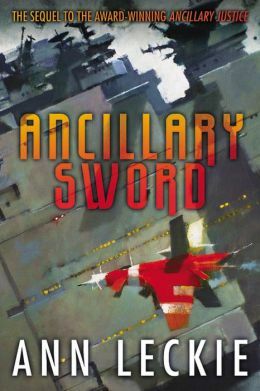 Ancillary Sword, Ann Leckie: I never thought Leckie would win this year, as back-to-back Nebulas are a huge statement, and #2 in a trilogy always drags a little. Still, a nomination should be a safe-bet, and I’d expect the conclusion of this trilogy, Ancillary Mercy, to be a major contender when it comes out. I told you the Nebula is hard to predict. Beyond Leckie and VanderMeer, I’m not sure anyone is “likely” to make the final slate, but a wide range of authors have good chances. Remember, the Nebula has been roughly 50% repeat nominees, 50% newcomers; if this year follows that trend, that would be good for Bennett and Addison. 3. 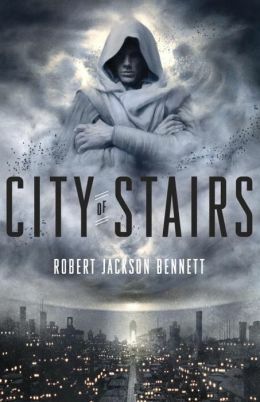 City of Stairs, Robert Jackson Bennett: Bennett has so many strong things going for him: a current #1 position on the SFF Critics list, the stand-alone status of his novel, its “edgy” take on what fantasy can be, that it almost seems like a sure-thing. My one hesitation is sales, as this hasn’t really broken out in the way you’d expect. Still, the Nebula is given by SFWA writers, not the general public, and I think this book has enough support to be at last 75% of a sure-thing. 4. 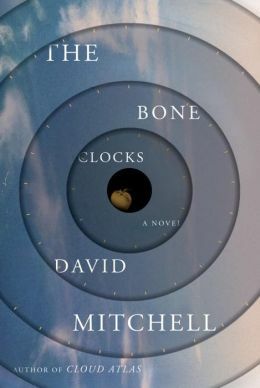 The Bone Clocks, David Mitchell: Until Mandel starting stealing his thunder, Mitchell was alone at the top of the 2014 Literary SFF heap. He won the Mainstream list convincingly, and sales for this book have been outstanding. I think Mitchell is also going to benefit from some “we should have given the Nebula to Cloud Atlas” sentiment. Think back to 2005, when Bujold won for Paladin of Souls. Which book has held up better? In a weird way, The Bone Clocks benefits from its massive length: if you read all 650+ pages of it, you wind up invested, whether or not it really seems like a “fantasy” novel. 5. The Martian, Andy Weir: This was the biggest debut SF novel of 2014, although eligibility issues—the book was originally self-published in 2012—are likely to prevent a nomination. It is also less “writerly”—and more action driven—than what the Nebula tends to nominate. 5. ? : The Nebula is voted on by a small group, and towards the bottom of the ballot it gets very unpredictable. Who would have picked Fire on Fire or The Red: First Light last year, or Tina Connoly’s Ironskin in 2013? While I’m not sure we’ll have a Nebula surprise this year, it’s a definite possibility. 6. 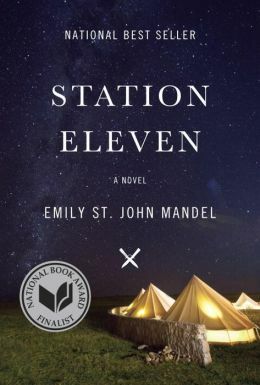 Station Eleven, Emily St. John Mandel: This is a little too high for me for Mandel, but I can’t think of a better option in this slot. The Nebula is often around a 50/50 split fantasy and science fiction, and the list is too light on SF. While Annihilation might “technically” be science fiction, it has a more horror feel, and Station Eleven is a clear post-apocalyptic novel. Maybe Nebula voters will feel guilty about not nominating The Road or Never Let Me Go? 7. The Goblin Emperor, Katherine Addison: Well received fantasy novel, offering an alternative to the dominant “grimdark” model currently so popular. Pen-name of Sarah Monette. After Bennett, the most buzzed about possible “newcomer” to the Nebula slate. 8. The Peripheral, William Gibson: Gibson hasn’t been in the Nebula mix for more than a twenty years, but this is a return to more traditional SF. The top part of this prediction is too light on SF for the Nebula, so Gibson might get a SF “boost” into the slate. 9. Coming Home, Jack McDevitt: McDevitt has 11 prior Nebula noms for best novel (! ), but this book didn’t grab much buzz. Still, those McDevitt fans are out there, and the top of the slate is light on SF. 10. My Real Children, Jo Walton: 2012 Nebula winner, 2012 Hugo winner, less SFF than her other works, although the Nebulas cares less about that than the Hugos. 11. The First Fifteen Lives of Harry August, Claire North: This has sold well and has gotten good buzz from both the Mainstream and SFF world. 12. A Re-Told Fairy Tale: Take your pick between Helen Oyeyemi’s Boy, Snow, Bird (less likely) or Genevieve Valentine’s The Girls at the Kingfisher Club (more likely). Both are historical novels that use fairy tale underpinnings to tell new stories. Valentine is better known to the Nebula audience (she was nominated for Best Novel in 2012), but Oyeyemi’s book is loved by the mainstream and is probably the most serious look at race in this year’s Nebula crop. 13. The Mirror Empire, Kameron Hurley: Had great buzz back in August, but hasn’t managed to make the year-end lists. 14. Echopraxia, Peter Watts: Watts doesn’t have much past success in the Nebulas (no nominations ever), but this was one of the more highly anticipated SF books of 2014. 15. Valour and Vanity, Mary Robinette Kowal: 2011 Nebula nom, 2013 Nebula nom for prior books in this series. 16. Yesterday’s Kin, Nancy Kress: 5 prior Nebula wins, including 2013 Nebula novella; 2 prior Nebula best novel noms. Depending on how the Nebula rules, this might show up in the Novella category. 17. The Girl in the Road, Monica Byrne: High concept debut novel, good buzz. 18. Broken Monsters, Lauren Beukes: Beukes has almost scored Hugo noms in the past, but she hasn’t done as well in the Nebulas. High quality speculative/detective hybrid. 19. The Three-Body Problem, Cixin Liu: My favorite science fiction novel of the year, and while Liu has picked up some good reviews, this hasn’t gotten the attention you might expect for China’s most popular SF author. Foreign language books are a hard sell to the SFWA. 20. Literary Fiction interlopers: A large number of books from the literary world have used speculative elements this year, and the Nebula has, in the past, been somewhat receptive. This long list includes Strange Bodies by Marcel Thereoux, J by Harold Jacobson (shortlisted for the Booker Prize), On Such a Full Sea by Chang-Rae Lee, Book of Strange New Things by Michel Faber, and The Bees by Laline Paull. If one of these books gets nominated, it would be similar to The Golem and the Jinni’s nomination from 2014. 21. The Lagoon, Nnedi Okorafor: 2011 Nebula nom, but this novel only came out in UK so it seems ineligible for the nebula. 22. Mainstream SFF writers: A lot of the biggest-sellers of SFF are missing from the above list: Brandon Sanderson, Patrick Rothfuss, Brent Weeks, Robin Hobb, James S.A. Corey, John Scalzi, Mira Grant, Charles Stross, Joe Abercrombie, Lev Grossman, Deborah Harkness, Diana Gabaldon, I could go on and on. These kind of massively popular books have never done very well at the Nebula awards, particularly if they are part of a series. I don’t expect that to be different this year, but you never know. For more info about the evolution and logic behind the list, check out the earlier version. That’s quite a list—a pretty busy year in science fiction and fantasy. Who’s on your list for the 2015 Nebulas? Who deserves to be here that’s not? “Best of 2014” posts are beginning to appear by SFF critics. These posts are a great deal more important for predicting the Hugos and the Nebulas than the Mainstream lists I’ve already collated. For whatever reason, these SFF posts tend to come out later in the year—it’ll be early January before a lot of major SFF websites and blogs get their “Best of 2014” up. And another 29 books appear only once. If you want the Excel file, here it is: Best of 2014; this list is located on the second page/tab at the bottom. The first worksheet is the Mainstream list. Note: I counted the Tor.com post as consisting of multiple lists; if you were picked by three critics on that list, you got three points. We’re still early to draw definite conclusions, but this list is shockingly different than the Mainstream list. Mainstream darlings like The Bone Clocks and Station Eleven are nowhere to be found. An author like William Gibson, who is famous enough for The Peripheral to make many mainstream lists, only appears on one list so far. The Martian doesn’t grab the critical headlines like it does the popular headlines. Instead, we have well-regarded but more “fantasy insider” books like City of Stairs and The Goblin Emperor. You really have to know the field pretty well to drill down to these books, and they are exactly the kind of books that the Nebula likes to honor. In fact, you could take the top 4 books off this list, add two random, lesser known SFF novels (the bottom of the Nebula slate is very unpredictable), and you’d likely have the 2015 Nebula slate. This list currently collates lists from Tor.com Reviewers, A Dribble of Ink, and two SFF critics/authors. Adam Roberts, author of Yellow Blue Tibia and Bete offers a thoughtful and comprehensive “Best of SF 2014” at The Guardian. Jeff VanderMeer, himself a leading candidate for the 2015 Hugo and Nebula, offers a much more eclectic (and multi-year) list over at Electric Literature. VanderMeer largely avoids traditional SFF in his list, instead favoring on cross-genre and international literature. Why these lists? Well, I’m looking for lists that represents the SFF critical world, including authors or critics that might actually vote in the Nebulas (SFWA members) or Hugos (WorldCon members). For this SFF Critics list, I’ve decided to collate the following: lists from major SFF blogs (defined by either popularity like Tor.com or by having been nominated for a Hugo best fanzine/best fan writer award) or lists from major SFF authors/critics. While there might be some argument in terms of who exactly I include, by collecting more and more lists that eccentricity should be diminished. We’re going to need at least 10 lists before things settle down and we get a clear picture, but this is certainly an interesting start. I’ll be factoring this information in heavily when I update my Nebula prediction tomorrow.